The Designer Vintage Bridal Show is my favourite wedding show of the year, it is full of cool, unique, and creative wedding suppliers and is visited by a huge variety of brides and grooms, all looking for something that bit different for their wedding day. For that reason I am more than happy to put my name to it and am delighted to say that I will be exhibiting there for the whole weekend, along with some of my other blogging friends. Today I thought I would give you a little run down of whom to expect when it comes to clothes, accessories and jewellery, just to wet your appetite and get you in the mood for the show! As well as some fo the most stunning fashion on show within the exhibition space, there is also a fantastic fashion show spanning the vintage eras from the 1920s right up to the 1970s, so a piece of vintage fashion to suit everyone’s style! Clara Bows was borne from my love and passion of the Roaring Twenties and the iconic looks on the silver screen at that time. I’ve created a unique collection of sophisticated and romantic hand beaded bridal dresses heavily influenced by this period blended with a more contemporary feel for today’s bride. From opulent dresses dripping in beaded fringe to floor length bias cut silhouettes with subtle capped sleeves and glittering glass beadwork, we offer an exciting and refreshing range of high quality beaded gowns. 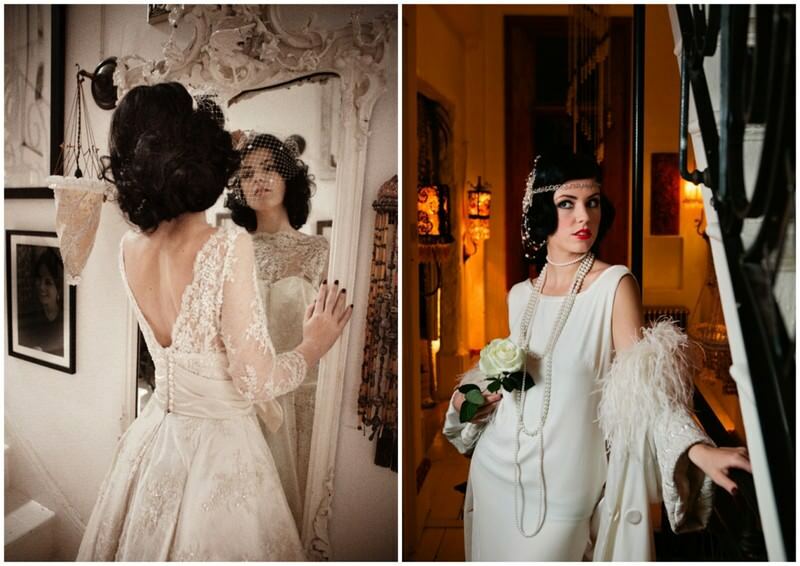 A Lindsay Fleming Couture vintage inspired wedding dress is as individual as the bride who chooses to wear it. Gowns are beautifully created using the finest silks and lace, trimmed with intricate embroidery and crystals, or adorned with hand tinted flowers and bows. Each dress is made-to-measure and collections are designed with flexibility in mind, offering clients countless combinations to commission the ultimate ‘retro’ look for their wedding day. 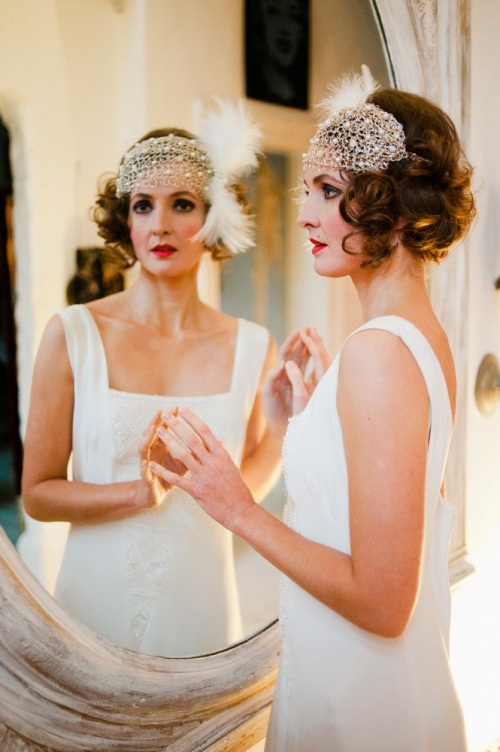 Whether you are looking for the glamour of the Twenties or the fun of the Fifties, visit our stand to see why we have been voted Scottish Bridal Designer of the year three times out of the last five years. 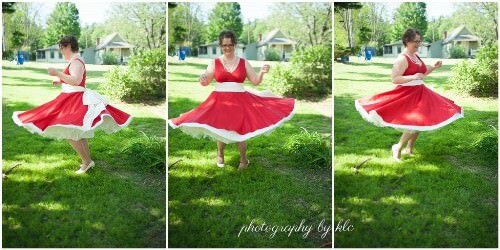 Lizzie Jayne is the result of my dream to design and create beautiful, handmade 50s style dresses for fun loving, individual and vintage inspired brides. My designs take the classic 50s shape and then give it a modern twist. I love that the simplicity can make the dresses so versatile and really allow for every brides personality to shine through. It’s incredible how many different looks can be created from the same basic design, from cute and quirky to breathtakingly elegant. Every dress is made from the highest quality sumptuous silks, beautiful cotton broderie anglais, incredible lace and polka dot tulle. I only sew with the best fabrics I can find. All of my dresses are handmade, by me, to your measurements. No sizes, no confusion, just an amazing dress made just for you. Designer dresses inspired by the heyday of Vintage Couture, from turn of the century tea dresses, to 1930s Hollywood inspired bias cut dresses, and full skirted gowns from the 1950s. All of our dresses are lovingly designed and created in our studio using the finest silks and laces, pearls and crystals, with beautiful and exquisite detailing. Sarah and her team aim to make the dress of your dreams become a reality, a true couture experience for the discerning bride. 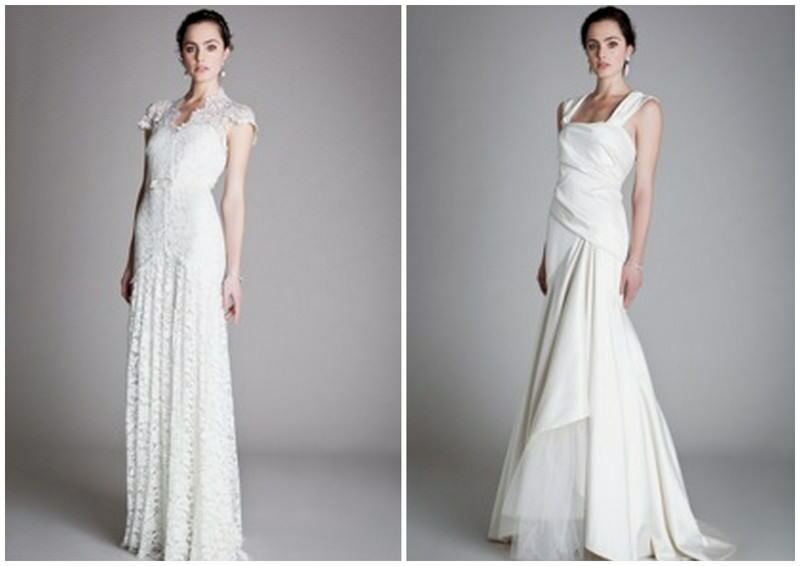 Temperley Bridal is an important part of the Temperley offering after the first bridal dresses were created following Alice’s own wedding to Lars Von Bennigsen, the CEO of Temperley Ltd, in 2002. This year sees the launch of the ‘Ophelia 2012’ Temperley Bridal collection, offering for the first time a selection of ready to wear dresses that will be available outside of the Temperley Bridal salons as well as online at temperleylondon.com. The exclusive Bridal Salons can be found in the London Mews, Los Angeles, Melrose Avenue stores and in the Dubai boutique for private appointments only. 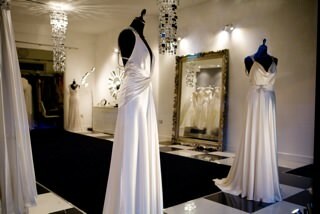 Exquisite contemporary bridal wear and irresistible accessories for those who demand to be gorgeous! The Wedding Club is an elegant and exclusive boutique conveniently located in Edgbaston, close to Birmingham city centre, with a relaxed atmosphere and an emphasis on service and style. 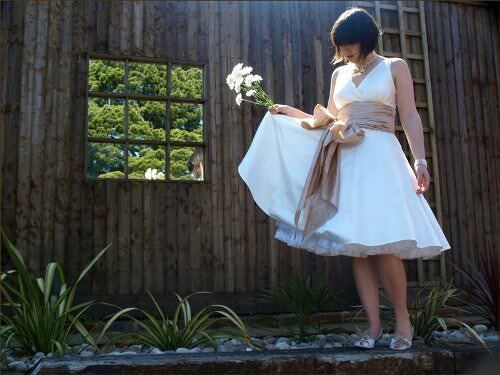 twobirds Bridesmaid is the go-to dress design company for stylish bridesmaids. Setting itself apart from the typical bridesmaid dress, twobirds Bridesmaid offers a collection of completely convertible, luxurious and timeless gowns that are flattering for every figure. Tied in 15 different ways, they are the perfect solution for an effortless shopping experience. twobirds dresses are made in the UK and available in three different collections: Classic, Two-Toned and Rosette. twobirds philosophy of simplicity without sacrificing on style has been carried through to the sizing structure; the dresses are manufactured in just two sizes (4-18 and 20-26), resulting in a hassle-free experience with no fittings or alterations required. 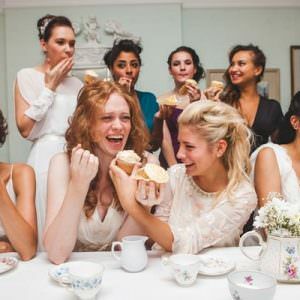 The collections are stocked in the twobirds Bridesmaid studio in Notting Hill and in a select number of reputable bridal boutiques throughout the UK and Ireland. 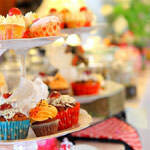 We sell original Vintage Dresses, hire out Vintage Crockery, and organise Afternoon Tea events. Britten is couture wedding accessories. Every piece designed by Sarah Jane, a graduate of Cordwainers (London College of Fashion) and made in our tiny workshop clinging to the side of a hill in Bradford-on-Avon near Bath. Debbie Carlisle creates luxury bespoke vintage jewellery bouquets and vintage and vintage-inspired headpieces and cuffs with a modern fashion forward edge. Debbie mixes antique brooches and buttons with crystals, pearls and diamante, combined with luxe fabrics to create one-off exclusive keepsake bouquets and headpieces which showcase her brides’ unique taste and sense of style. Brides can have their own heirloom or sentimental pieces worked into their bouquet to make it a truly personal keepsake treasure. 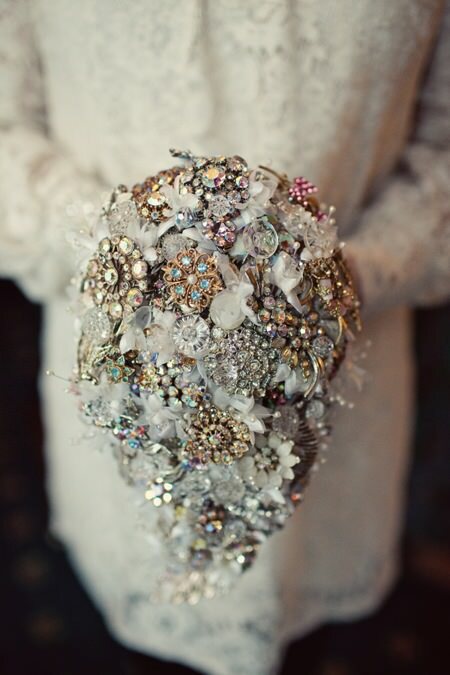 Debbie’s designs include her distinctive trademark teardrop shape – including the elaborate Teardrop Shower bouquet packed with vintage brooches and buttons and a Jewel Brights bouquet made entirely from colourful statement vintage jewellery. Debbie’s headpieces and cuffs take their inspiration from the 1920s, 1950s, 1960s and 1970s – with a fashion-forward twist. Choose from seriously sparkling diamante combs or headbands – many of which are finished with vintage jewellery to ensure your headpiece is one of a kind, or try Debbie’s collection of organza ribbon bands which allow brides to indulge in delicate floral fantasies or sparkling jewel-encrusted day dreams. Styles range from boho woodland nymph to regency ballroom, 60s ingenue, 70s hippy chick and rock n roll goddess. 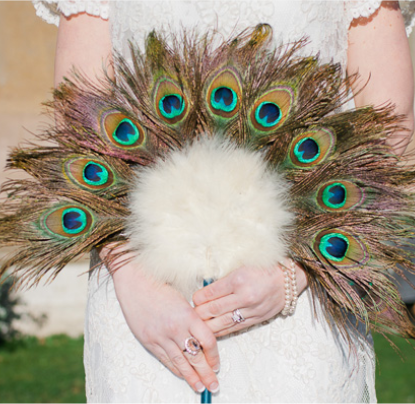 Gillian Million celebrates 12 years of creating the most beautiful bridal accessories to be treasured and admired. Unique vintage and contemporary designs for both the subtly understated and the most dramatically flamboyant bride. Designs that you never knew existed will overwhelm you. Gillian Million can interpret your own designs with a bespoke appointment service either by Skype or in her shop. Feminine details, Swarovski crystals and pearls, fine laces, hand cut silk petals, twinkling rhinestones and vintage millinery elements combine. 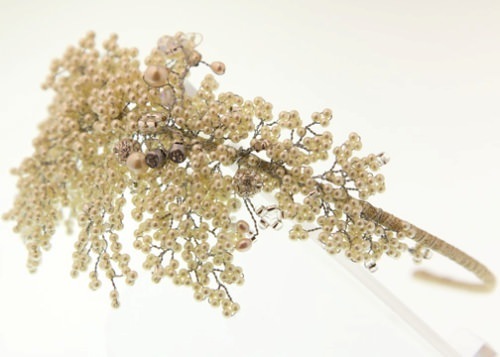 Delicate, precious, luxury pieces for brides who dare to dream differently. Away from the traditional tiara or vintage headband. Inspired by the whimsical daydreams of the first flush of love. Pretty things, twinkling twilight city skies, the ballet, romance, summer gardens, notebook wishlists, old novels, hope. 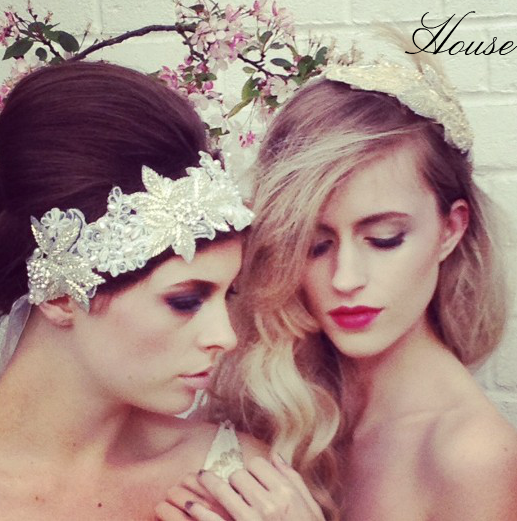 House of Istria creates couture hair accessories by hand, in our studio in the heart of the Cotswolds. Inspired by love and romance. Kate Francis has an undergraduate degree in Performance Arts having studied at London Contemporary Dance School and Middlesex University and this is where she probably has got her dramatic flair from. 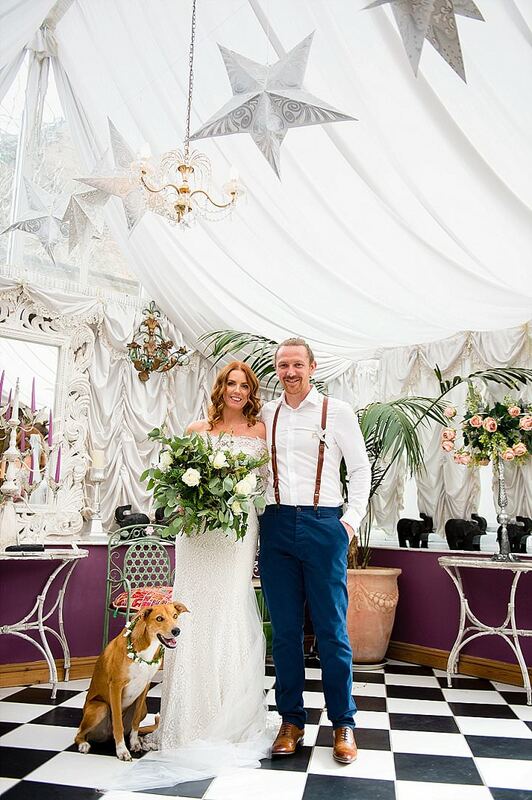 Leaving the stage behind Kate worked as an event manager and wedding co-ordinator and consequently knows everything there is to know about weddings. Inspired to make her own bridal headdress Kate studied millinery and now designs and makes hats, bridal headwear and fascinators. Kate’s career in the performance arts has helped to form her classic and elegant style and each hand crafted piece is totally unique. Kate works closely with the client from conception to the finished item resulting in a bespoke piece that perfectly matches that special outfit. 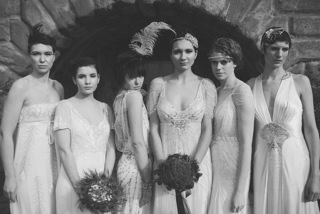 Kate Francis launches her first collection of bridal headwear. Taking inspiration from the vintage era, theatre and couture designs; this millinery has a truly distinctive, yet utterly feminine style. Each piece is individually hand-crafted using an array of materials to create totally unique items of headwear. Silk, taffeta and sinamay are sensually draped or ruched over iconic forms, adorned with exquisite feathers and intricate beading in pearls or Swarovski crystals. The attention to detail with this first collection presents a unique, yet fresh contemporary feel, whilst gracing the feminine form perfectly, adding a dramatic statement. “Look Back in Glory”. 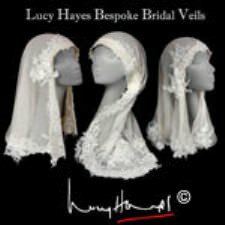 The Bespoke Vintage and Retro Collection by Lucy Hayes. From her workroom in Sherborne Lucy will design and make you a unique Bridal Veil to become an Heirloom for tomorrow. Every veil she creates is guaranteed to be absolutely original. She uses only the finest materials available and takes great pride in creating individual and unique pieces, exclusively designed with the specific requirements of the bride in mind. Her collections fall into four categories: Classic: classically styled cathedral or chapel length veils made with silk tulle and contemporary French or English lace, often embellished with Swarovski crystals, pearls and fine beading. The veil will be presented in a beautiful archival quality box and packed in layers of acid free tissue for safe long term storage. 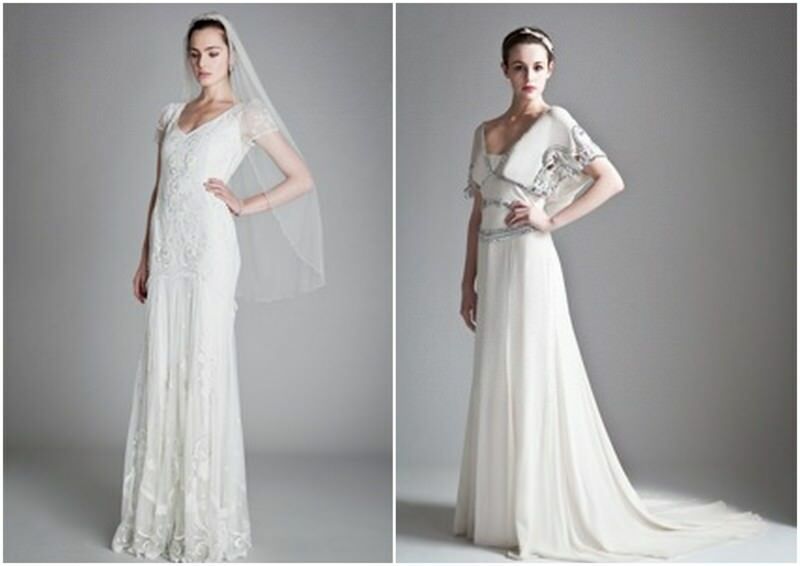 Vintage: classically styled pieces using antique lace and silk tulle. Retro: a concession to the 20’s, 30’s and 40’s era using contemporary materials and a heavy French net with heavily beaded applique work. Decade: an interpretation of the 50’s, 60’s and 70’s with large bows, pleating and gathering, and extensive use of the Russian veiling more commonly known as “birdcage veiling”. 01935 389400 or [email protected]. A minimum of four months notice is requested. Ruse Couture offers a personal design service to recreate your ideas, and dreams and turn them into reality. Pure Silk Corsets and Bridal Wear designed exclusively for you- each corset is unique and oozes decadence created by the use of sumptuous fabrics such as silk lace, lashings of trimmings, brooches and ribbons. Jewellery bouquets, button holes and shoe trimming also available. 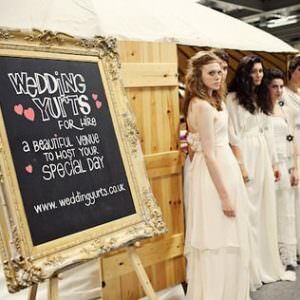 ‘Vintage Service’ including gowns which are Purely Vintage and Truly Inspired! 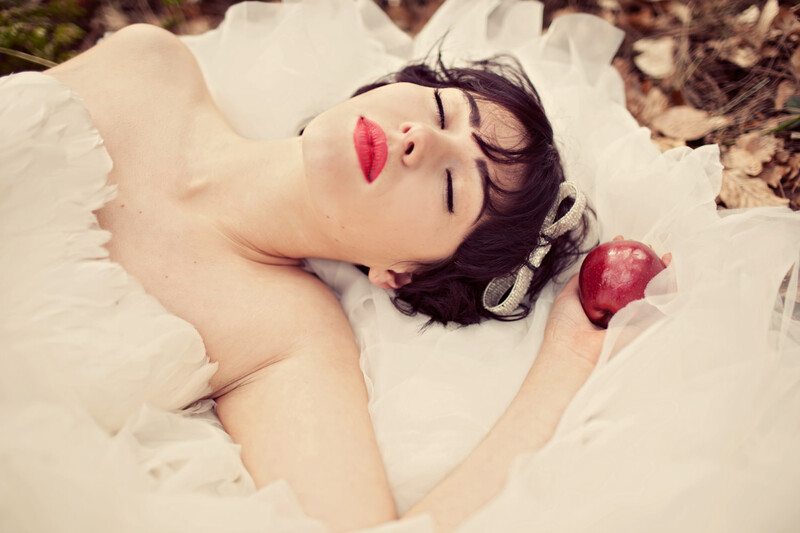 Natasha Jane personally hand makes each piece of vintage inspired headwear and bridal headband using Swarovski crystals and silver plated wire with freshwater and Swarovski pearls. Introducing feminine details like a pretty delicate bow in glass beads, an elegant halo of crystals or a fluttering of butterflies the Natasha Jane collection is one for the modern day bride who loves the vintage inspired look. Choose from the Natasha Jane collection which is available to see online or at The Wedding Club or take advantage of the bespoke headwear design service and create something unique to you. The bespoke service is the ideal choice for the bride who wants something different from the mass market and wants a hand in creating the desired look that will complement and enhance ‘the’ dress. Add a touch of golden age glamour with inspiration from the art deco period infused with a showering of sparkling crystals, the perfect choice for your vintage inspired wedding. Tallulah’s Trinkets has been lovingly created to bring the discerning bride a luxurious and delicate collection of hair adornments and jewellery. Each intricate design is handcrafted using Swarovski crystals, diamantes, freshwater pearls and reworked vintage jewellery. 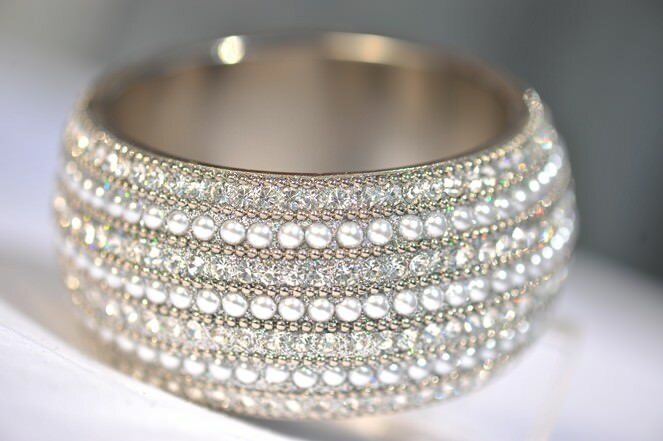 The era of glamour, elegance and timeless beauty is the inspiration behind my pieces. Each one is individually created and range in style and boldness. For unique and one off pieces the ‘original vintage collection is perfect but for that bride who has a specific vision in mind then the bespoke service is essential. This service provides the bride with the ability to bring that vision to life and create another timeless beauty. A Tallulah’s Trinkets bride will benefit from outstanding care, consideration and a treasure for the future generation. terryterry accessories was formed in 2009 with a clear focus to provide wedding evening and fashion accessories at an affordable price. Our bridal offer blends vintage inspired pieces with all the glitz and glamour of the red carpet beautifully, whether you go for our classic vintage inspired pearls in ice white or champagne right the way through to our crystal encrusted headbands and haircombs, here at terryterry we strive to make our brides day the most spectacular day it can be. The Finer Details will be launching their exciting new line of distinctive brooch/button bouquets and accessories at the show. Each piece will be lovingly made from a selection of materials including vintage jewels, buttons and fabric to create something that will be cherished for years to come. Every bride is unique and each has their own story to tell. Your bouquet and accessories can include family treasures, trinkets or items of sentimental value. As you walk down the aisle you will be reminded of who they came from and the stories behind them, while at the same time creating your own very special story to tell. I Hope that has given you a taster for the show and I hope you ave seen some companies there that you would like to visit! There are so many beautiful items to comment on…first of all the vintage dresses are exquisite. I love vintage clothing because they are so well made. Hidden gems like french seaming and button plackets. Next on to the bouquets, who wants to be like everyone else when you can be outstanding! These bouquets are in a class of their own! Love them! Now to the gorgeous fascinators that Lucy Hayes makes. I am so in love with them. 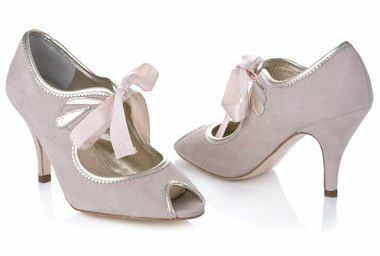 Rachel Simpson’s shoes looks like they were created yesteryear yet they have a modern touch to them. The jewelers did an excellent job with their scrumptious gems. I guess as you can tell, I really love this post! Great job!